More changes in the Quast household. My mom has lived with me for the last 3 1/2 years since my father passed away. I feel we have both helped each other through some pretty big changes in our lives. First missing Dad and going through that year of "firsts" without him. It was tough for Mom in so many ways since they had lived together for over 45 years and were simply each others best friends as well as husband and wife. I was certainly not what mom was used to living with and I hadn't had a roommate for a looooooong time. We both had a lot of adjustments to make but I think we did pretty well. Then we decided we needed to add a little youth to our lives so we adopted...Kit & Kaboodle. Two pups from the pound who certainly changed our lives. They were a lot of work as puppies but a lot of fun too while we waited for my adoption to come through. Mom and I took dog training classes with them when they became more than just cute little balls of fur. Just a reminder to Mom that SHE was the one who picked out Kaboodle and said she wouldn't be that big. Looking at her paws I knew Mom was wrong and since Kaboodle now weighs in at 75 lbs, I hate to say it but I told you so Mom. Kit is just a tiny little brown guy at 50 lbs. Here they are as grown ups. They are truly inseparable and as much work as two are I'm glad they had each other (and a dog sitter of course) when mom joined me for the adventure of a life time to adopt Lexie. 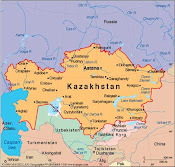 Mom was really a trooper in some pretty....lets call them challenging situations in Kazakhstan. She was great during the visits with Lexie at the baby house and has been wonderful with her since we got home. But Mom has been talking about getting her own space and a quieter space as well, I think. There's nothing nosier than a two year old and Lexie has certainly become a typical two year old. Mom needs to try living on her own since she never has and I couldn't be prouder of her. So Mom bought a little house a few blocks from my sister Angie, her husband Jim and their 3 children in the outskirts of Houston. Housing is simply too expensive up here but she got a brand new 1800 sq ft rambler with 3 bedrooms, 2 baths and high end finishes with almost enough room for ALL of her stuff. She deserves it!! Up here I couldn't have found her a mobile home for the price she bought her new home for. So we packed up all her stuff from the house and her FOUR storage units full of treasures and had them transported down south the week of her 70th birthday. What a present to herself. She has plenty of room for us to come visit her which is just what we'll be doing for Thanksgiving. So Lexie and I are missing our roommate but we know Grandma is just a phone call away. We love you mom!